I'll bet no one can recall in what movie a cut from the CD Glow was used a few years ago. I can't remember either, so I'm hoping I lose my bet and someone calls me. I didn't include the song on a cassette tape I am making of "memorable movie music," a collection of really special pieces that are used at a film's end and is background for the credits. This particular piece was embedded in an interior scene, and only part of it was played anyway. So I can't go to that tape and find out. But it was in February of 1999, and I am 99% certain that my wife and I were watching a video at home and a remarkable song made its entry and the piece was really striking! This waif-ish feminine voice sang a lovely lyric for an all to brief of time and was gone. I have a distinct appreciation anyway for the female voice, my favorite musicians being Karla Bonoff (all of her work), Sarah McLaughlin (Surfacing), Jonatha Brooke (& The Story), k.d.lang (particularly Ingenue), Mary-Chapen Carpenter (virtually everything), Carlene Carter (Little Love Letters), Aimee Mann (Whatever and I'm With Stupid), Juliana Hatfield (Only Everything), Joan Osborne (Relish). I should also include Rickie Lee Jones (Traffic From Paradise), Suzy Bogguss (Something Up My Sleeve), Shawn Colvin (all of her work), Jann Arden (Time For Mercy), and Bonnie Raitt (all the stuff I've heard). Some may recognize a few singers here with "weird" voices (that description coming from my wife); such was the voice from the movie. These are voices that I really enjoy and that are quite moving to me, but "weird" in the sense that they aren't as pure as THE VOICE, that of k.d.lang, who, in my opinion, has the most purely delectable vocal instrument ever, at least of the twentieth and twenty-first centuries. More on this topic inn a moment. Anyway, this aforementioned marvelous song made its short life through one scene of this movie (what WAS its name!) and after the film ended I scrolled slowly and carefully through the music credits trying to detect the title, trying to recall some of the words of the piece. And I found it. Keeping Awake, by the innocence mission. I went to the Internet to find out about it and bought the Glow CD right then. That was in February 1999. And, as I describe elsewhere in a story about a perfect way of discovering remarkable music, virtually the entire CD was overwhelming to me. What an extraordinary experience, listening to each cut in the intimacy of good headphones, the voices and instruments resonating in magical ways inside my head. Except for the second cut, Bright As Yellow,1 each cut is phenomenal! (Sorry fans, I know that many adore this particular tune--it just doesn't quite appeal to me--but that's the thing with differences of taste in music, we all possess our own.) I have relegated Glow to my "sacred pile" of music, that which I don't listen to very often in the attempt to not get too used to it, to keep it fresh, and insuring each new listen one of delightful remembering just as in seeing again an old friend with whom long ago daily contact produced a deep and rich relationship but you haven't seen in years; you pick right back up without skipping a beat. So it is to come back to this CD, it is as moving as when first heard. Other works in this category are Surfacing by Sarah McLaughlin, Ingenue, by k.d.lang, and New World by Karla Bonoff (there are others). To be sure, there are some sacred things in life, and music is one at the pinnacle. And Glow resides easily in such company. The music is alternative. The voice is Karen Peris who writes most of the music and the words. Her husband Don, collaborates on the music which envelopes Karen's poetry like a light mantle of glory. The lyrics are quixotic, an elliptical expression of a childlike peace, curiosity and serenity amidst a complex adult world. While listening to Glow I am transported back to my own childhood and the pleasant memories of wonder and discovery. The voice and the music will not appeal to everyone (like my wife who is more of a Barbara Streisand person), though that being said, I love it. It evokes a mood to be enjoyed with full concentration. This is not "background music." At least not for me. This is sound to be paid full attention, preferably with eyes closed to minimize external sensory distraction, so the full auditory experience of tone wrapped in clear space can be enjoyed at maximum. The voice is wispy and childlike, though not at all the banal nasality of Nanci Griffith, whom I really would prefer to like but can't. Karen's singing is more buoyant, fragile, perfect for the poems evoked from her soul. The guitars and drums embrace this sweetness with a powerful richness, not overpowering noise, but a sonic smoothness of a deliberate hand crafting. It's funny too that a couple of cuts start out instrumentally that almost make me wince (I said almost), as in "I'm not gonna like this one," only to find that it quickly develops a fabulous rhythm, tone and melody. (The same thing happens once or twice in Sarah McLaughlin's Surfacing with the same results.) The effect, probably not intended as such, is a wonderful surprise, and seems to enhance the pleasure. Like my first experience listening to New World by Ms. Bonoff, I found progressing through each cut of the CD an indescribable pleasure (cut 2 excepted). It was a brilliantly lovely experience, one to be savored. 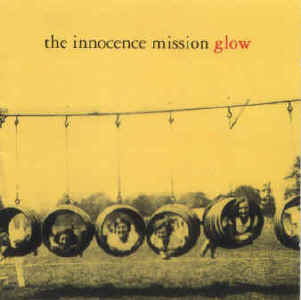 So here I am, three years from my purchase of Glow, and I have been a bit fearful--no, maybe hesitant is a better word--in buying another innocence mission (IM) record. I can't afford to buy a lot of CDs. And I have been burned too many times in loving one CD and then hating the next by an artist. A couple notable examples of this phenomena are Carlene Carter's follow-up CD to Little Love Letters (I don't recall its name and I gave it away), and Martina McBride's follow-up to The Way That I Am, titled Evolution but really should have been titled Devolution. This latter work was so strikingly awful--in my opinion, of course--that to hear the beauty, the cheer, the refreshing singing, music and writing of The Way That I Am, it should be inconceivable that her next work would be so pedantic, pedestrian, ugly, dark and disturbing. It was a real shock! In any event, I haven't had a repeat of the magnificent experience I enjoyed when I discovered Karla Bonoff. If you read the link above you'll see that I found exceptional every CD she made, and even that of Bryndle, a record she made with three of her old cohorts, writers and producers and friends from her musical past. (Bryndle (a self titled CD) is truly an incredible musical experience!) So I know repeating the excitement is a fairly rare phenomena. At least for me it is. But with a gift certificate from Christmas I realized I could take the risk and buy some more IM music. After doing some web searching I found the good IM web sites 2, found an IM email list, found the ftp site (ftp://timission/timission@130.89.232.187) 3 (thanks for letting me download a hundred and more megabytes worth of IM music! I am grateful for that.) and after reading lots of reviews and interviews of and by the principles, I chose Small Planes (their latest) and Birds of My Neighborhood. I haven't taken possession of them yet, though they did ship from Amazon today (2/7/02). So I am excited in expectation, thinking that indeed I may be blessed with another of those ever-so-rare events in music. We'll see. I certainly hope so. Now, if anyone can report with accuracy and certainty the name of the movie that housed Keeping Awake, I will be just that much more at peace. And the film was really good, too! 1 I have received a number of responses to the plea I posted on the innocence mission email list: Which film exhibited the track Keeping Awake? I want to thank everyone who responded trying to help! So far my challenge is still open to all. The suggestions made by helpful souls have not yet reaped the correct answer. Not that I know what the correct answer is (yet) but I will "know it when I see it." 1. The song I heard was really Bright As Yellow found in the film Empire Records. 2. The song I heard was in the film Eight Days A Week. As for the Empire Records suggestion, that the song really was Bright As Yellow. It wasn't, as I mention in the link above, Bright As Yellow didn't move me in the way that would have me scrounging the credits of the film looking for the artist and title. Keeping Awake definitely would. I just love that guitar riff that starts it and then every thing that follows. So, seeking relief, I just wrote an email to the address on the innocence mission web site thinking that maybe my plight (if it can be characterized as such--I am, after all, still able to sleep at night) will be passed along to someone in the group or close to the group who would finally put the issue to rest--with a correct answer. Which might be "it's all in your head, your making the whole thing up!" However, I'm 99% sure I am not delusional so until proven otherwise I'll keep searching. But not maniacally so. And thanks again for those offering attempted answers. I appreciate your effort to help. 2 http://timission.netfirms.com/index.shtml, and http://www.huan.com/im/, and the official innocence mission web site. Other links abound within these URLs. And you can do a Google search for "innocence mission" for many more. And for an interview with Karen and Don visit this MP3 site. 3 It took me a while but with some help I realized that writing the ftp notation like "ftp://timission/timission@130.89.232.187" just meant the host was ftp://130.89.232.187 and the login and password was "timission." 4 All the nominations are in, the contestants have been judged, the ballots have been cast. May I have the envelope please? SamNHisDog! Let's hear it for him, folks. He goes by the name Jerry and tonight (Feb. 9, 2002) he correctly identified the movie in question as Dream For An Insomniac, (1998). With Ione Skye as Frankie; Jennifer Aniston as Allison; Mackenzie Astin as David Shrader; and Michael Landes as Rob. The opening and a verse and a half or so was played of Keeping Awake. So that is definitely the film I was looking for. I got Jerry's email this evening, went out and rented the video pretty confident that this was the correct movie from the description on the Internet Movie Database. That's where he found the answer. I use the IMD all the time but failed to realize that it frequently works for soundtracks. So I didn't even attempt a search there, just used Google. So I just finished the movie again since first seeing it in 1999. I did remember the movie. It was a good film. And there was another favorite performance inside, Aimee Mann's I'm With Stupid, from the CD of the same title, another really, really fine record. So thanks to all for playing. You've been just great. See you all again on the next edition of "Where Did You Hear That Tune?" This story was adapted from a note I wrote to an innocence mission email list on 2/7/02. See list details at http://timission.netfirms.com/list_faq.shtml.